Hi. 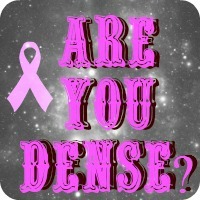 My name is Marian and I have dense breast tissue. Apparently, this isn’t uncommon. Unfortunately, like my waistline and my brain, it’s getting more dense with age (thanks again, Age), which makes mammograms less useful than they might be. Cancers can sneak and hide behind dense tissue and just squat there like Chucky dolls waiting to jump out and go Boo! So my doctor has scheduled me to see an oncologist tomorrow. He’ll decide what, if anything, to do next. Here’s a link to a site I just turned up and may be haunting for a while, the awesomely named Are You Dense? You’re welcome. I’m posting today at Fatal Foodies about an instant and oh-so-good dessert. A WRITING PROMPT FOR YOU: A character gets news and isn’t sure whether or not to worry about it. This entry was posted in Grab bag. Tagged PSA. Oh. Wait. I mean, I, too, am dense! Hope there’s nothing to see. From your mouth to ghu’s ear, Jane! Oh, f***. I’m assuming they’ve done ultrasound? Biopsy? Holly, they did an ultrasound last year. Apparently, the density is increasing. This consultation tomorrow will decide if they’re going in for a biopsy, doing another ultrasound, doing an MRI, or what. A mastectomy is out of the question; I just bought half a dozen new bras. Oh, hell, you can get the thing reconstructed while you sleep – I needed BIGGER bras when they were done with me. (If you have a few extra pounds around the midsection, it’s all good. Poor Angie needed implants.) No, in all seriousness, doing it the way I did it avoided weeks of radiation and/or chemo. Heck with that. I was under 12 hours, in pain for about a week, and back to work in 5 weeks. I would not have it any other way, given a choice. And I don’t have to stress over it anymore. Honey, if I moved what’s around my midsection and shifted it north, Dolly Parton would sit down on the floor and cry. No, those girls have just been hanging around getting in the way for most of my life. I’d have to consult Charlie, of course, but I told him IF they had to come off, at least I can take up archery. Snow, if you get my drift. My thoughts are with you, my friend. Hoping for good news!